The Place If you are a Char Siew person, CHAR Restaurant should definitely be on your radar. The casual dining restaurant was previously located at Guillemard Road, before moving to its current premise along the buzzing food enclave of Jalan Besar, a few doors down from Xiang Yuan Ji Shanghai Pan Fried Dumpling (read our full review here). The space at Jalan Besar is a two-storey shophouse, which was packed even on a Tuesday evening. Founded by two Vietnamese born chefs Anthony and Alvin who have vast experience working in Chinese restaurants during their UK days, the culinary team has a new boost to the already strong team in May – new Head Chef Chi. Chef Chi himself has previously worked in Raffles Hotel and Imperial Treasure specialising in Cantonese cuisine. The Food With the new head Chef, the restaurant has introduced some new dishes to their menu but one item will never change – their Signature Char Siew ($6 per 100g / min 300g). This is a must order dish whenever we visit CHAR, and it is hard to tell that this plate of meat contain more than 30 ingredients. The meat belongs to the fatty category as it uses pork belly, with a sweetness which is just right for me. The sauce simply goes so well with white rice. Other than the signature Char Siew, the Premium Slow-Roasted Char Siew – (S$20 per portion / Limited to 10 portions a day / dinner only) is a newly introduced dish which uses Kurobuta Pork Belly instead. The main difference is that this is much more tender, as the meat has more marbling. Another unmistakable trait is the smoky flavours as the meat was roasted over charcoal and sweet lychee wood. After having it, I told The Rantee that this is the Wagyu of Char Siew. I highly recommend this dish, and the safest bet is to pre-order due to its limited portions daily. For other to share, the Passionfruit Prawn Ball (S$22) is like a healthy alternative to salted egg prawns. The overall taste is a natural sweetness of the passionfruit dressing. One of my favourite dish other than the Char Siew is the Charcoal Beancurd with Spinach and Wild Fungi (S$14.80) where Chef makes the beancurd daily from scratch. 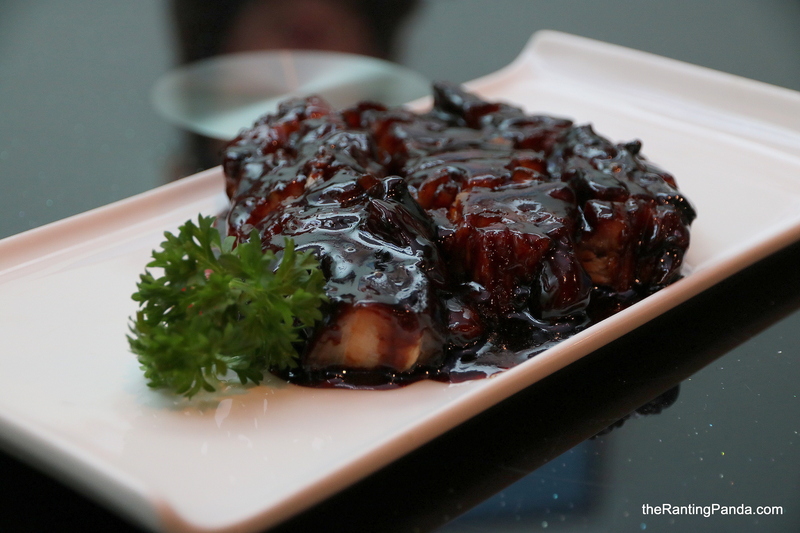 Topped with mushrooms and oyster sauce, the texture of the beancurd is soft and silky. The dish which caught me by surprise is the Signature Double Boiled Chicken Soup (S$10 / Limited bowls per day). My first thought when I took the first sip – it was really rich and creamy! The soup is prepared by boiling chicken bones and cartilege for several hours to lend it the collagen-rich broth, consisting of chicken, morel mushrooms, white cabbage and dried scallops. This is probably one of the most value for money double-boiled soup! Crispy noodles is one of those comfort dishes I enjoyed at ‘zi char’, but crispy egg noodles sounds even better. This plate of Crispy Egg Noodles with Kurobuta Pork (S$16.80) is definitely good for sharing between 2-3 persons. The noodle flavour itself is very distinct, made better by the thick broth which comes along. Other new dishes on the menu include the Fresh Wild Yam with Pork in Sambal Sauce (S$13.80) with slices of pork, crunchy wild yam discs, as well as the Black Garlic Stewed Chicken in Casserole (S$15.80). Rants The restaurant looks slightly dated, maybe that is part of the homely and rustic ambience? Will I Return Again? For the delectable Char Siew, we will be back any time. Been to that restaurant and absolutely love it! The Char siew is to die for! Just went there last friday…the char siew and the dishes are marvellous! Love it!! One added point-service is good! We love the char siew too, glad you enjoyed it!